This is a companion piece to my Harvest Moon Flower Farm Spotlight, a video I recently released interviewing the owner of Harvest Moon Flower Farm, Linda Champman. One of my first jobs was a floral assistant. I worked weddings most Saturday’s through high school, pinning boutonnieres while most of my friends were sleeping in. After college, it became quite clear that I was built to be an entrepreneur and would thrive working for myself. I pinched pennies working a few jobs until I was able to pull together the funds open my flower shop. I owned and operated Peppertree Floral here in Bloomington for over 10 years and loved nearly every minute of it. As my kiddos got older the schedule became increasingly more difficult to maintain, so sadly I moved on. Now, years later, I still find myself yearning to clip some stems and create colorful arrangements for my home. This month I got the itch and decided to take a trip to Harvest Moon Flower Farm. 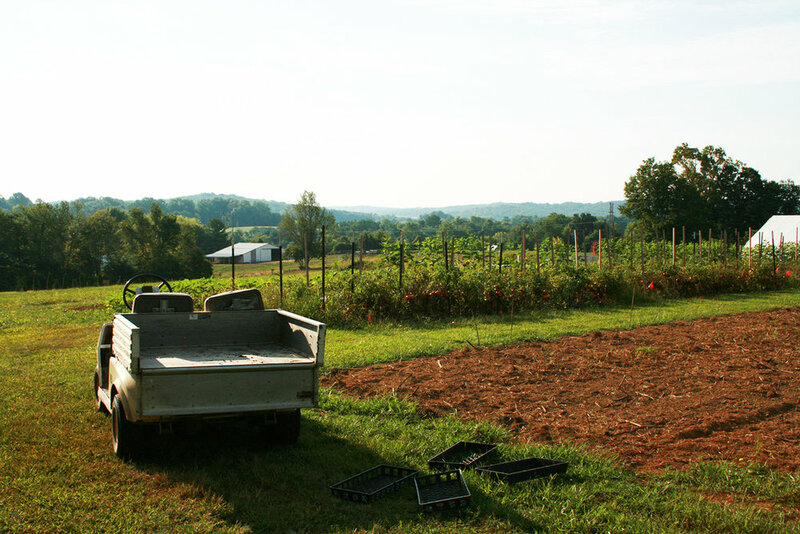 The owner, Linda Chapman, walked me through the farm and handpicked some blooms for me to work with. The farm was an inspiration. 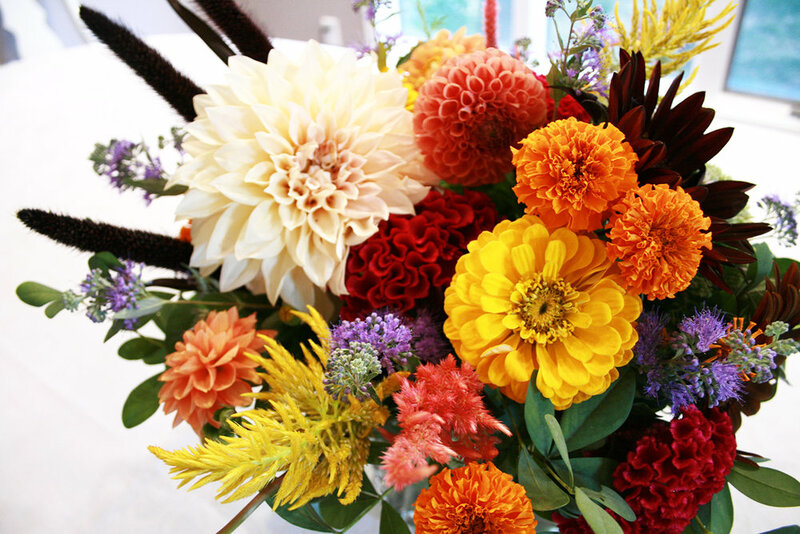 Fall colors cascading through the rows, sunflowers, dahlias and zinnia in shades of orange, brown and red. Arranging flowers can seem intimidating, but there are a few things to keep in mind to make flower arranging a cinch. Start by purchasing high-quality flowers. When you get them home, give them a snip and let them drink in a bucket of warm water. It’s easy to get frustrated when your flowers keep slumping to the side, but you can avoid this by choosing a container that isn’t too big. If you are doing a tall arrangement gather the stems in your hand and make note of how wide the neck of the vase needs to be to accommodate. With a short, squat arrangement, like this one, look to the flowers heads. The vase should be slightly smaller than all the blooms pulled together. Don’t overthink it. If the first vessel you pick doesn’t work, just pull the flowers out and start again with a different vase. 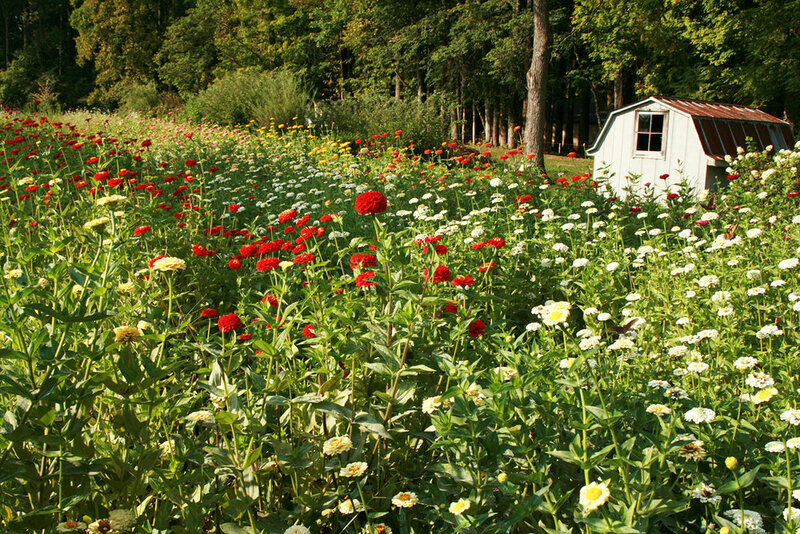 For your blooms to stand up you’ll need a sturdy foundation. Create this with ample greenery. The greens don’t need to be fancy. In this arrangement, I nipped some branches off my baptisia plant in my garden. As long as it’s leafy it’ll do the trick, but don’t overstuff it. You still need room for the flowers. Create the shape of your arrangement with the larger blooms. Think of these flowers as an outline. 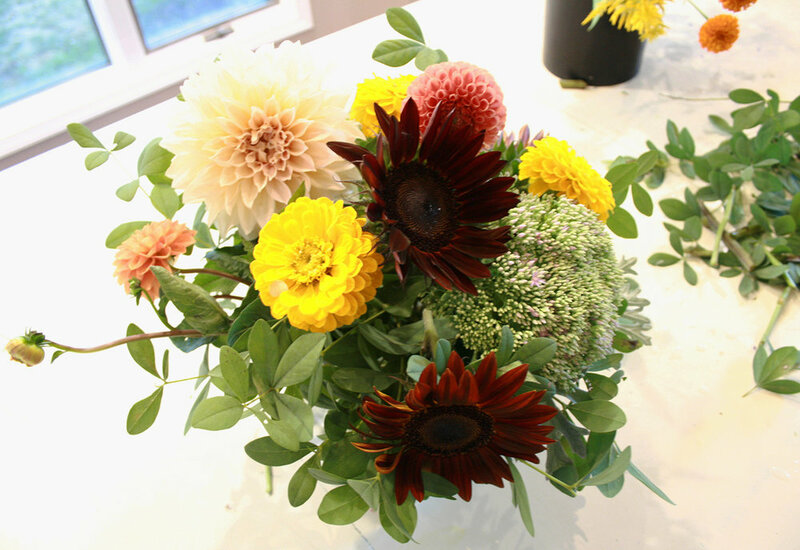 It was clear the café au lait dahlia was the showstopper for this arrangement so I chose where to put that stem first, followed by the dark chocolate sunflowers. 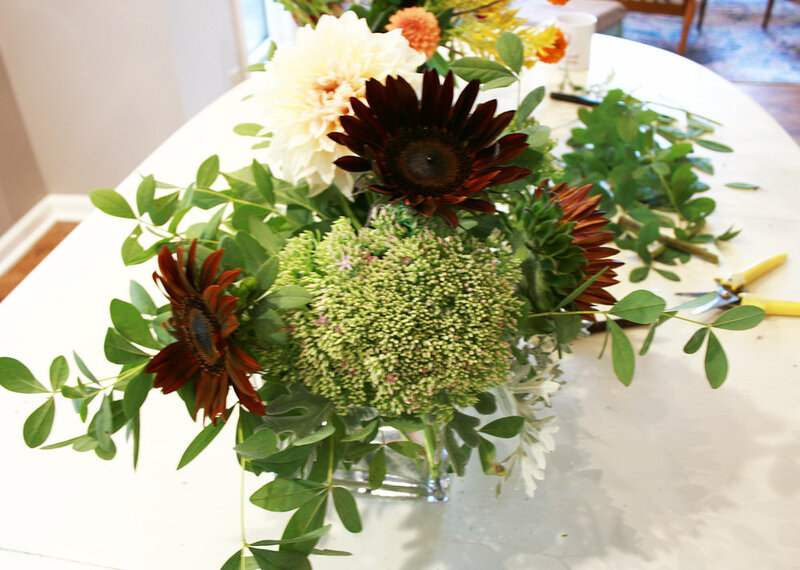 Try to space them throughout the vase without being too symmetrical. Nature is not perfect, so your flower arrangement shouldn’t be either. Next, I placed the peach dahlias, gold zinnia, and fuscia cockscomb. Use these buds to fill out the arrangement and give it structure. Turn the arrangement as you work so you don’t create it one sided. You’ll want to work all stems toward a central point to give the bouquet a natural look. 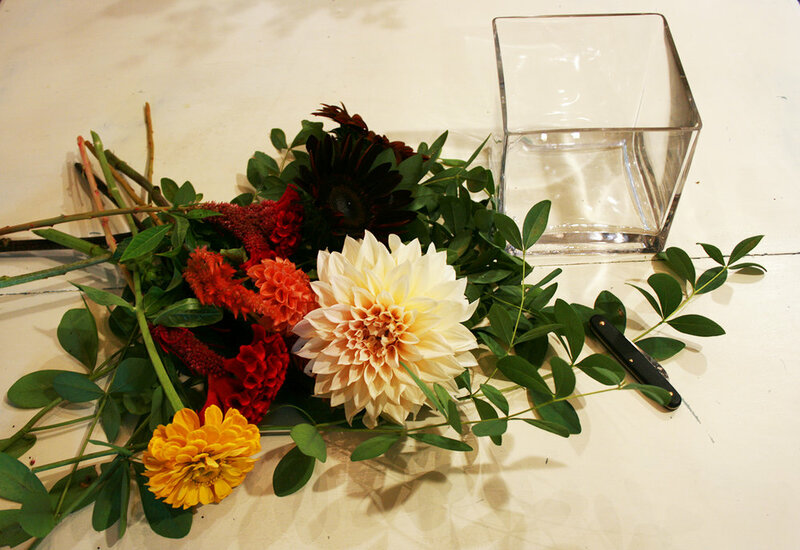 Use your small filler flowers, in this case, feather Celosia and marigolds, to fill any empty spots. This is another opportunity to give your arrangement shape. 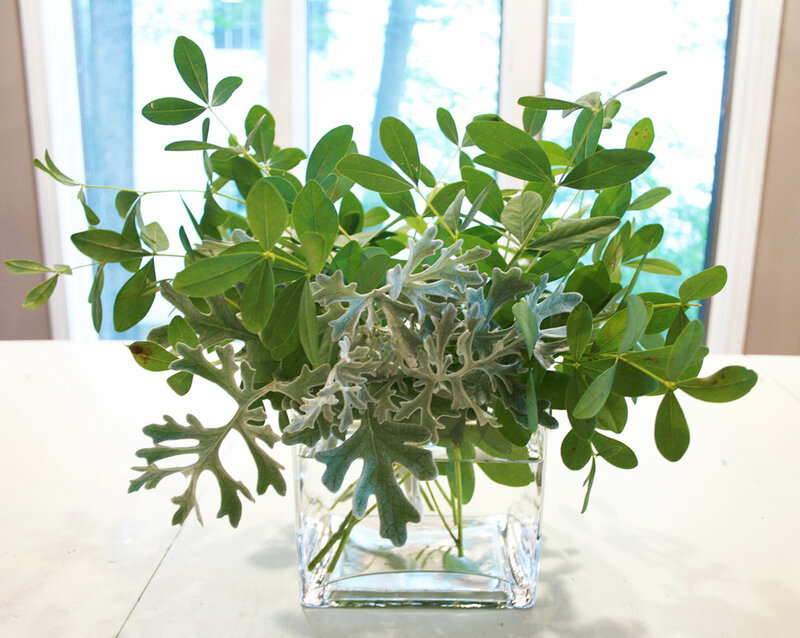 Wispy tendrils or woody branches can be added to make the arrangement more romantic or impressive. Now that my arrangement is complete I can enjoy it at my dining table. I added votives and tall glass candle sticks to add to the ambiance. 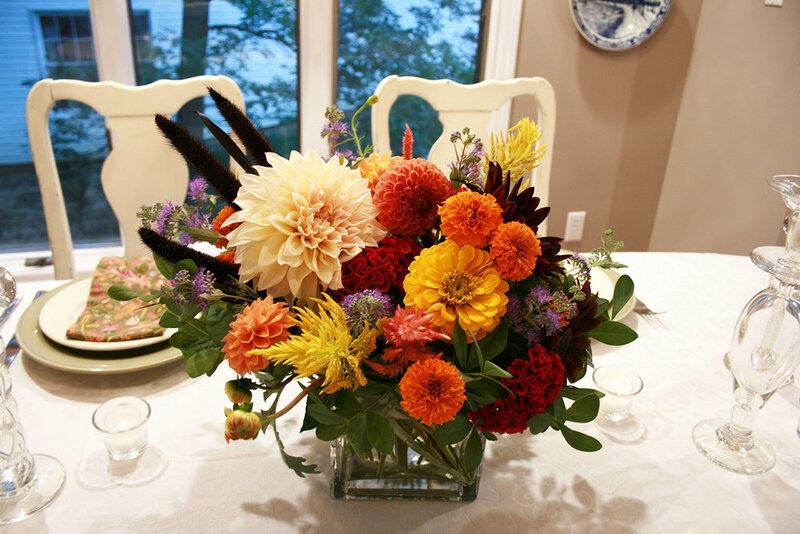 Fall is not the time of year most people think of cut flowers, but it’s a wonderful time to bring those autumnal colors to your table. Next time you need to jazz up a table, don’t think twice. Just roll up your sleeves and make something beautiful. To find flowers like the ones shown in this story, track down Harvest Moon at the farmers market and buy yourself a bunch. You won’t regret it. This story first appeared in The Herald Times on September, 2nd 2017.